...a blast, and props to the organizers, which included Boris Mann (whose booming voice was the first thing I heard when I entered the office complex). -Yule Heibel, who thoughtfully discusses the W2 Project discussion, which was the session I most regretted missing, in her post here. The agenda was made by the entire group and managed by Boris Mann and Darren Barefoot, Photo by Tyler Ingram (Source). The photo of the agenda was taken by John Bolwitt (Source). I had the chance to sit down and meet Boris at the lunch break. Thanks to fellow BCITer Mack Flavelle (more on that later). It was great to get advice from those with more experience. The conversation was part of another discussion later on in the day entitled "Balancing Passion & Frustration" (Notes by Jenny Lee Silver). That discussion was led by Boris and Mark Busse. I liked Mark the moment he opened his mouth in my first session of the day which you can read about below. Intelligent, outspoken, opinionated and caring; the kind of person who even when you don't agree with everything they say is teaching you from a valuable perspective. 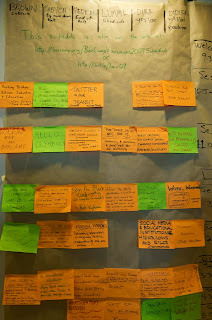 The first session of the day for me was the one on the top left in the post-it note agenda above. Cam Cavers ignited a discussion on "Building Bridges between Industry and Education" (Live Blog by Raul Pacheco, Photo by RocketCandy, Source). It was IT and web professionals sitting down with small business and educational parties. Some people represented all 3 perspectives through their experience. Discussions ranged from how interns and co-op students are unprepared to work, often coming from major degree granting institutions with a continued focus on 'theory' to how there is not enough collaboration among high-tech educational professionals. From my perspective the main need expressed from the group was a better way to meet and qualify students. I spoke up and recommended that they speak to classes and create relationships with faculty who then will recommend the most competent students for immediate employment opportunities. My friend Toan Dang had a even quicker idea: connect with students through clubs and student associations. The discussion concluded and Cam has set-up a mailing list for future connection. I hope anyone who wants to be a part of future if this discussion will contact Cam Cavers or myself for more details. a perfect example of what I didn't like. I posted a reply on his blog so be sure to check it out and see for yourself. I am still waiting for some actually constructive feedback (which I love, bring it on! :). I will continue to wait and respect all opinions in hopes of learning. 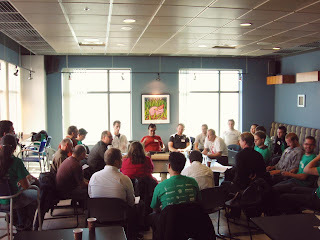 Barcamp Vancouver 2009 was an incredible expression of cooperation, passion and community. I will tell you more about it in the next post. 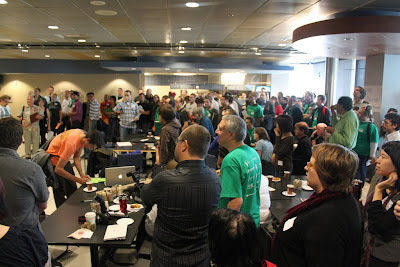 Ultimately, Barcamp was about all three of my passions: technology, community and education. What more could I ask for? Signing off with these two pictures: one of the line to tell the room about the session you wanted to lead (By Peter Andersen, Source) and one of the room listening intently to the each speaker in turn (By GusF, Source).